With a background that spans several roles in the manufacturing and music industries, I have worked closely with a diverse mix of professionals, from construction contractors to entertainment media executives on projects ranging from water resources to album marketing campaigns, to international music tours. Driven by a natural interest in large engineering projects as well as a passion for music and sound, I am interested in the potential for thoughtful acoustical design to improve the human experience of the built environment. To that aim, I am currently working toward a masters degree in Architectural Acoustics at Rensselaer Polytechnic Institute in Troy, New York. 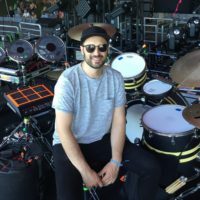 Since 2011, I’ve been based in LA and have worked in the music industry, primarily as a recording and touring drummer with SOHN, Conrad Sewell, Rozzi, The Samples, and others. I have also worked closely with Eric Corne and his label, Forty Below Records, where I lead data-driven online marketing initiatives for releases by Blues Hall of Fame artist, John Mayall, Austin Music Hall of Fame artist, Bill Carter, as well as studio engineering, producing, and composing. This work sometimes required me to build my own project studios, and through that process, I became more familiar with the need for quality noise isolation and acoustical room treatment. 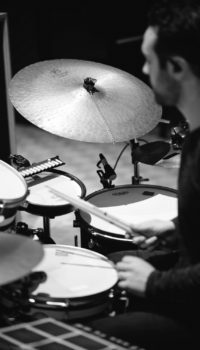 At the same time, performing in venues around the world, I gained a new appreciation for the building, its finishes, and systems from the standpoint of a musician. Previously, I lived in Denver, Colorado and worked for Baski, Inc., a manufacturer of proprietary geotechnical products. At Baski, I lead and co-lead the mechanical design and fabrication of numerous pre-fabricated and custom products. 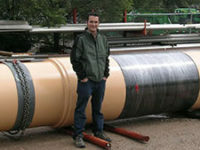 Some of the projects I was involved with include custom 36-inch casing packers (pictured below) for grouting on the Navajo Generating Station Water Supply Line at Lake Powell in Page, AZ and deep well sampling systems for Groundwater Monitoring at Los Alamos National Laboratory.